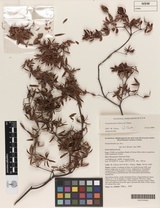 Description: Shrub ascending to trailing, lignotuberous, often multistemmed from base; stems terete, branchlets reddish-brown, villous with spreading white hairs to 1 mm long. Vegetative growth units terminal or axillary, axillary growths often giving rise to pseudowhorls of lateral branchlets. Leaves sub-erect to reflexed, spirally arranged, more densely clustered distally. Petiole erect, 0.4–2.4 mm long, pilose. Lamina dark green, paler abaxially, flat to concave, distally sometimes slightly incurved, ovate to broadly elliptic or elliptic to lanceolate, (4.5-)10–20(-30) mm long, (1.2-)3–5(-9) mm wide; base broadly cuneate, obtuse to subcordate; apex acute; margin reflexed and often hyaline to flat and non-hyaline distally, ciliate, hairs to 1 mm long; venation obscured adaxially, prominent abaxially, 3–16 main veins; adaxial surface glabrous to sparsely hairy; abaxial surface glabrous. Inflorescence a poorly defined leafy conflorescence with several axillary spikes aggregated distally (occasionally terminal or arising from nodes on older stems); axillary spikes/uniflorescences shorter than leaves, c. 4 mm long, (2-)3–5(-7) flowered, terminated by a bud-like rudiment. Flowers inconspicuous, erect; bracteoles broadly ovate, concave, c. 1.1–1.5 mm long, margins ciliolate, glabrous or with scattered hairs. 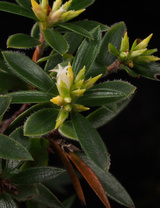 Sepals greenish with lighter venation, ovate, concave, c. 2.5–2.9 mm long, apex acute to acuminate, glabrous or with distal hairs c. 0.05 mm, margins hyaline and ciliolate. Corolla white, urceolate; tube slightly shorter than sepals, 1.3–1.5(-1.8) mm long, glabrous or outer surface with a few scattered hairs distally; lobes narrowly triangular, erect with apices spreading to reflexed, c. 2.1–3.3 mm long, 1.5–2.4 times longer than corolla tube, inner surface hairy, hairs contorted, outer surface glabrous or sometimes with scattered hairs to 0.1 mm long. 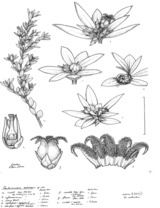 Stamens exserted but obscured by erect lobes; filaments inserted at or near sinus, filiform (appearing somewhat flattened in dried specimens), c. 0.6–0.7 mm long, glabrous; anthers 1.1–1.2 mm long. Pistil c. 2–2.5 mm long; ovary ovoid, tapering into style, c. 0.5–0.7 mm high, (8-)9–11 locular, glabrous to sparsely hairy apically; style papillose, (1.1-)1.5–1.7 mm long. 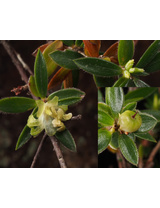 Fruit green, sometimes tinged reddish-purple, becoming translucent white at maturity, glabrous to sparsely hairy apically, globular, slightly ribbed, 4.5–5 mm high, 4.5–5 mm wide, style and often a spent flower persistent, dehiscent; pyrenes pale yellowish green, subreniform, c. 1.7 mm long, arranged around a short columella, free from the mesocarp at maturity; mesocarp whitish, thin, fleshy. Distribution and occurrence: Known only from New South Wales, where it occurs on a few ridges along the northern flank of the Grose River, south of the Bilpin-Berambing area in the Blue Mountains, and from the Oz Mountain area in the north-west of Wollemi National Park. 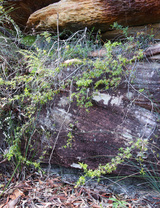 Found exclusively in crevices of sandstone outcrops and cliff-lines, usually with a south to southwestern aspect, in sheltered to open situations in eucalypt woodlands or forests. Altitudinal range is about 300-500 m for the southern populations (Grose River) and about 600-800 m for the northern populations (Oz Mountain area). Fruits on cultivated plants have been observed to mature during the flowering season following fruit set.